One of our readers, Jean-René Rodrigue, wanted to share his homemade micro camper with you. It’s a custom built teardrop trailer designed to be 8′ in length, 5′ in width, and 5′ in height on the interior. Outside it’s length is actually 11′ 8″ and it’s overall height is 6′ 6″. It weighs an estimated 750 lbs and has a 2,000 lbs axle on it for support. The flooring was built using fir plywood. The walls are a composite material made out of epoxy-fiberglass and polystyrene foam. When he added the roof Jean-René went with ultra high molecular weight polyethylene plastic. Interesting! The trailer framing is all welded steel and as you’ll see, he painted it a really cool lime green color. It’s got a nice shine to it. Jean-René added a 4″ thick queen size foam mattress. He brings along plastic containers and an electric cooler to store food and other camping equipment. Why would you want to build your own micro camper teardrop trailer? Here are the reasons that Jean-René did it, and it makes a heck of a lot of sense. I was impressed to find that Jean-René designed and created his own trailer. He made the 5′ x 8′ trailer out of steel square tubing and angles along with a jack stand for each corner. Jean-René got 8″ steel wheels and a 2,000 lb axle with leaf springs. He followed up by painting it an aluminum color to make it look nicer. For this project, Jean-René used composite materials for the walls. He actually put this together in his apartment. Inside there’s 1.5″ of foam sandwiched by two layers of epoxy coated fiberglass. This material is much lighter than plywood which is usually used for projects like this. Another benefit of using this material is that if exposed to moisture, it won’t rot. The walls are held together thanks to screwed planks at each end which you can see in the pictures below. Jean-René chose ultra high molecular weight polyethylene plastic for the roof which he attached to the edges of the wall with stainless-steel screws. This material is great for resisting cold temperatures and it’s very flexible and is less likely to dent, ding, or kink. It’s also lightweight compared to plywood. Nothing really sticks to this material so it can’t be painted but this also means that bug splatter won’t stick either. Jene-René built his own door with a window and door latch that he ordered. See below. To paint the micro camper, Jene-René took the walls apart and used a green urethane-based paint. He kept it white on the inside, then he put it back together and sealed everything with silicon and butyl tape so that it’s watertight. See below. The finished product looks great and he is planning on doing it again so be sure to visit his blog. If you want to see more pictures visit his Picasa photo album and for more details on his project visit his website http://www.teardroptrailerkit.com/. If you enjoyed this post share it using the buttons below and talk about it in the comments. Thank you! Alex, you still considering a tiny-house road journey at some point? Deek, yes, I still think about it and want to. Splendid. I just love this!! Great photos. 4 stars! Go girl!! Just to correct something. It’s a HE and not a SHE ;). Jean-René is a friend of mine. The girl you see in the last pictures is his girlfriend. My fault. Thanks Sebastien. I’m fixing it now. Ok fixed it, so sorry about that..
We, too, built our own Teardrop – but ours is a woody! Can’t go anywhere without lots of questions. Great way to meet people. (I’ve even started a blog of our trips: dlvent-teardropper.blogspot.com.) Learned a lot along the way. Thanks, Lynn. Nice to meet you! This is so cute! I love the color and the fiberglass construction. I’m always looking for the best way to make the lightest camper to tow…nice job! Glad you liked it Mariah! Thanks for the article. I’ll keep you inform when I will do modifications ans upgrades on my teardrop trailer. I am also looking forward to read about other stories of DIY micro campers. Thanks! Looking forward to your updates and thanks so much for sharing your project with everyone. I would be careful with that one. According to my rough calculations it will blow over in a 35 mph crosswind. I’m designing a teardrop and my target is to survive a 74 mph crosswind. Thanks Dave, never thought of this, so great to know. Here are more exact calculations on wind tipping. I am modeling the profile of your trailer as a half-circle having a radius (r)of 5 feet. The area is Pi(r^2) = 79 sq feet. The center of effort (where the wind force appears to be concentrated) for a half circle is (4r/3Pi) = 2.1 feet from the bottom. The bottom of the trailer is 1.5 feet above the ground which puts the center of effort of the trailer wind load at 2.1 + 1.5 = 3.6 feet. The center-to-center tire spacing is 5.5 feet. The trailer weight is 700 lbs. The torque needed to begin to tip the trailer is 700 lbs. X 5.5 feet X 1/2 = 1925 ft-lbs. What wind force does it take to produce a torque of 1925 lbs on this trailer? The wind torque is equal to the wind force X 3.6 ft. When this equals 1925 ft-lbs it will begin to tip. So, a wind force of (1925 ft-lbs)/3.6 ft = 535 lbs will do it. With an area of 79 sq ft the force per sq ft = 535/79 = 4.5 lbs. V = (force/0.0033)^0.5 = (4.5/0.0033)^0.5 = 37 mph. I have been trying to find out if there are regulations on industry standards on this so I can design my camper without over designing it. My target of 74 mph might be on the high side. Due to this target my trailer designed length is 6.5 ft with an inside height of 4 ft. It weighs 500 lbs. A cut-out feature in the back gains me 3 mph in wind survival. I ran calculations on several commercial light weight campers such as Lance and Scamp. Their tip over wind survival works out to be 62-65 mph. I’ll take that an an “industry standard” and design accordingly. Shooting for 62 mph lets me build a 5′ tall (6′ ground to top), 6.5′ wide trailer if I make it 600 lbs. To do that I add two group 31 batteries for power and ballast. It’s sort of like ballasting a sail boat. I have review your calculations and they are quite interesting. I haven’t check tip over torque during my design. But, I’ve seen a mistake in your calculations, side area should be 79sq.ft/2=39.5 as side wall is half a circle, not a complete one. Also, by checking my autocad drawing, I can say that the side wall is exactly 32 sq.ft. That way, tipping would occur at a wind of 91mph. Thank you anyway for sharing your calculations. Glad you cleared that up, thanks! Good catch on my error. With an error of 32 sq feet rather than 79 sq ft the wind force has decreased by a factor of 2.5. Force produced by wind is proportional to the square of the velocity. So the tip over wind velocity is now 37 mph X (2.5)^0.5 = 59 mph. Much better and this is in line with the small lightweight campers available on the market. And it’s what I’m aiming for with my tiny trailer. I got plans for the tears drop camper years ago, and couldn’t find anyone to help me build it. I have no build knowledge and wish to build one soon. Currently TN. Thanks, Thomas, wishing you the best in finding some help with your project. Maybe I can give you some advices about the construction of your teardrop trailer. Feel free to ask me specific questions. What kind of plans do you have? I would be curious to see them if you want, maybe it would help me give you better advices as well. Keep me inform about your project. Hi i was wondering how much this cost to build it. How long would this take to build as well? Hi Veronica from what I’ve seen it everyone takes a different amount of time to build and it depends on how detailed the interior is going to be, how skilled you are, and how much time you can spend on the project. I’ve heard of these costing as little as $1500 or so to build, sometimes even less, and as much as $8000.. Just depends on what you want it to have. Hope this helps and thanks! What a great idea. I’ve been interested in travel trailers since I was a little kid. I like the whole lightweight trailer concept that can be pulled by a car and I enjoyed reading about your project very much and I think it turned out very nice. Where would this world be without smart creative men who can pretty much build anything! Thanks Nick!! Glad you liked it! Outstanding build, you guys did a terrific job on this camper. I am impressed, i like the color, very unique. Inspiring. Love your trailer…a few questions. What thickness of plastic did you use for the roof? I’m assuming there was not any insulation added to the roof…is it warm enough when the tempurature drops? Do you sell the plans or step by step instructions on how to build this? Thanks! Great little trailer! You guys did an awesome job. Love the shape and colors. Wish I was going to be close enough to see it in person tp get ideas for mine. Keep up the good work and enjoy your creation! Thanks for your good comments. Where are you living? At what stage of designing your teardrop are you? Looks GREAT! I’ve welded up a very solid 6’x14′ platform that I’m going to be putting a teardrop on. I’ve had the idea for composite walls for a long time. Saw how it is used in aircraft and thought it would carry over to a camper nicely! My plan is to glue together the foam board and then layer up 3 or 4 layers of fiberglass per side and then screw on some wood framing around it to give it some more rigidity. The wood frame would double as the mounting point for my cross members for my roof/front/rear. Thanks for publishing this article! Glad you found it helpful Brandon. Thanks! I’m glad you liked my design. 6feet by 14 feet, it’s gonna be a huge teardrop! You’ll see, fiberglass/foam walls are really strongs. Do one layer of fiberglass on each side first, then you’ll see how strong it is, maybe it will be enough! Post pictures of your project when you’ll got some. Maybe instead of calling it a teardrop I’ll call it a waterfall? Who knows maybe it’ll be the next wave of campers between 5th wheel and teardrops! Early on in this design I convinced myself that I needed the interior space, but also wanted the benefit of aerodynamics from the teardrop shape. I’m curious to see how it turns out too. It’s one thing to look at a drawing, and another to see it in person. Thanks for posting your work, really motivated me to stick with my foam board idea. Great post on Teardrop Trailers. Our kits make them really easy to build ! Yes, they sure look great! Ty Alex. Say Deek, think you could use that Tuftex stuff on one of these? Just askin. Happy Trails and God bless you. 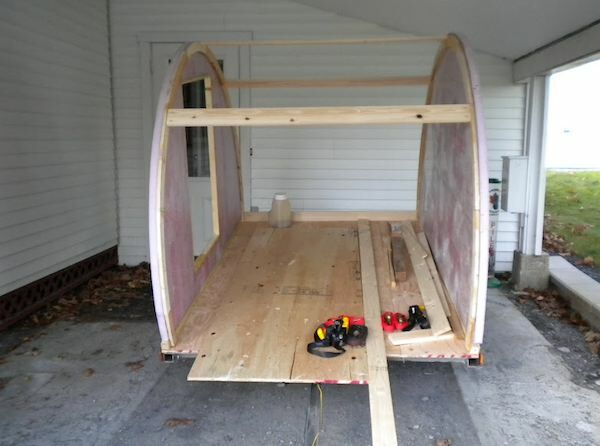 I’m the builder of this teardrop trailer. I believe the Tuftex sheet could do the job. But, be carefull not to build yourself a greenhouse on a trailer. My plastic used for the roof was white, but was not blocking 100% of the light, so I had to add a layer of plywood inside the trailer to block light. I like to see teardropr trailer from others, send me pictures if you build one. If I wanted to build a teardrop that is 7 ft in height, would this cause any problems? Looks great…. just what I need! ‘Would love to see the interior, tho’! nice! I am thinking of building one. What are your thoughts on using polycarbonate double or tripple wall panels for the roof and walls? Seams strong. I used these panels on my sunroom roof. I don’t know about polycarbonate panels you’re talking about. Send me a link so I can check it. Here is the link to one of the retailers that sells the double walled panels. The panels are stringer that glass. These panels seem great. Just watch out to make sure to build a teardrop and not a greenhouse. I’ve used 1/4-inch white plastic panels for my roof and it was letting through too much light. I had to add thin plywood panels on the inside to keep the trailer dark enough. You may check my website http://www.teardroptrailerkit.com/ to see many pictures of the construction. I also explain each step of the building of my teardrop.